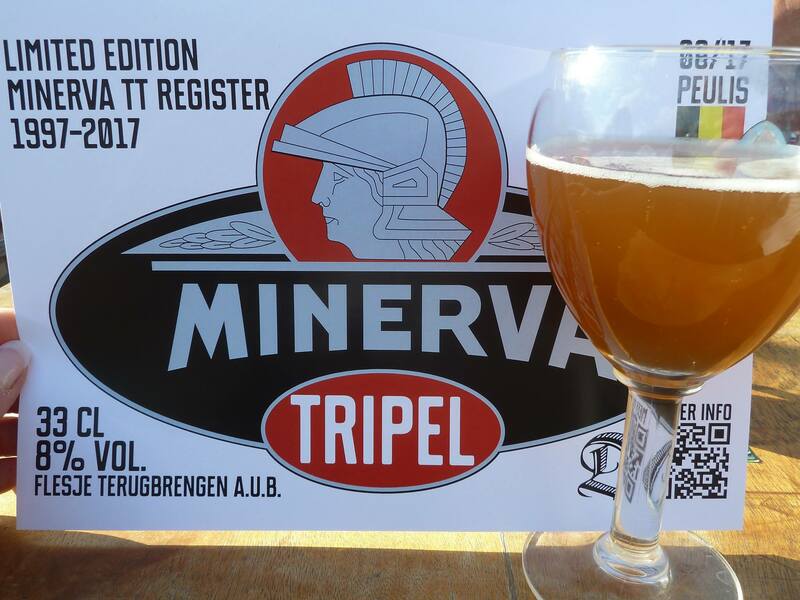 My dad organised a weekend long event for members of the Minerva TT Register (an oldtimer club) in september 2017. I thought, what better opportunity to test out all of this new equipment I’ve gotten! It’s also a fun and much more memorable thing to give to guests. Along with the equipment I had also bought 2 malt kits, one was a tripel, the “Brewferm Bryggja Tripel”. It seemed like the a good choice for a first time grain brew. I also replaced the dry yeast with a packet of "WLP570 Belgian Golden Ale Yeast" (they didn't have the "WYEAST 1388 Belgian Strong Ale" in stock). My friend Michiel helped with the brewing and botteling. The recipe is for 3 step mash, we use BIAB so we had to modify the recipe to 60 minutes at 67°C. Lesson for next time: Calculate this time and temp instead of winging it :smile: . OG: 1.080, but we had too much loss during boil, so we added water till we hit 1.070.